A quick pic before heading to a little local museum on Friday. We're finally over all our sicknesses and I have the energy to get out! 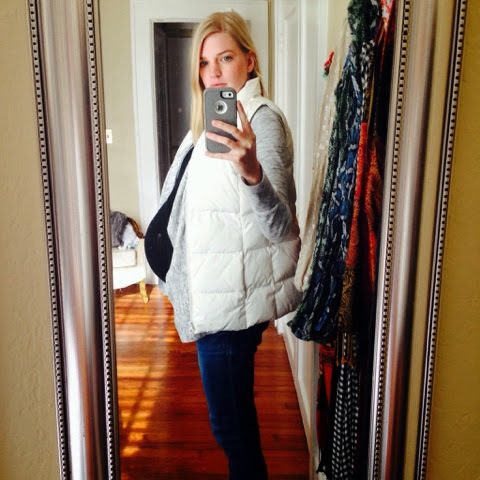 I'm on a mission to find some cute, affordable clothing to wear during the horrific 4th trimester. I'm going to do my best to wait at least a month before trying to go shopping for clothes; I'll be wearing sweatpants and maternity tops probably, but here's what's been on my mind lately. I'm so starved for non-maternity clothes, shirts without ruching and regular jeans with no stretchy belly panel! I'm going to be nursing my Little Guy no. 2 hopefully, but I hate, hate, hate designated nursing clothes--so I'm going to skip that. It worked really well with Little Guy #1 to wear a shaper cami under tees for more coverage to avoid flashing my flabby post-baby belly to the world. Some of this I already have, like the drapey white button down, chambray shirt, cute patterned flats, amazing baby bag and the gray dress, but my wardrobe will need a MAJOR overhaul. And I have a few stipulations: comfort, nursing-friendly, washbility,and seasonless-ness (is that a word?) because I want to be able to wear most of these pieces during the hot, hot Georgia summer and early fall. Obviously I would swap out the pants for shorts and there won't be a need for a leather jacket. -One great black leather moto jacket. I'm really lusting after a black leather jacket--I have a brown one I've worn and loved and worn and loved for 5 years, but it's starting to look worn and beat. Plus, the brown is starting to look a teensy dated. I'm going to watch for this one from Gap to go on sale! -One pair of great jeans that fit and hold the jiggly, postpartum tummy in--I'm trying to decide if I dare splurge on those Madewell high rise flares--they're so expensive at $135-but there's almost nothing more annoying than cheaply-made jeans that don't fit right or sag in the bum or knees. -One great pair of super comfortable slip-on sneakers to wear with everything. I have some laced Vans that I love, but if I'm doing a lot of babywearing, I will want some slip ons I can put on quickly to run after my toddler. I love the black--but that's just me. -One pair of cute, patterened flats. I don't really tend to wear many patterns, but I love these shoes. They're not the most comfortable but they are really cute and go with everything. I wear them a lot. -One or two (or three) nursing-friendly, casual day dresses to throw on and look instantly put together. -One cute, trendy sweatshirt to wear alone or over a cami or button down. -One interesting, different tee shirt (I am a stripe addict) in a swingy, slightly cropped shape I can wear over a nursing or shaper cami. -Three casual tees for everyday. I love my Everlane tees for this; they don't pill or lose their shape and are really reasonably priced. And they are deliciously comfortable and drapey in the right places. -A button down. the chambray button down will be worn as a top AND a jacket. I did this earlier on in my pregnancy when I wasn't GINORMOUS and it was cute. -I don't need them but I really, really want those cutout booties! These could be worn almost year round. They're reasonably priced too. -And last, but not least, a great baby bag. I LOVE this bag and will use it long after I'm done having kids. Other than this, I have 2 coach purses--one I've carried for 5+ years and still love, and the other I've had for more than a year and love it just as much. So the price tag is worth it if you think cost-per-wear! So, it's been awhile. 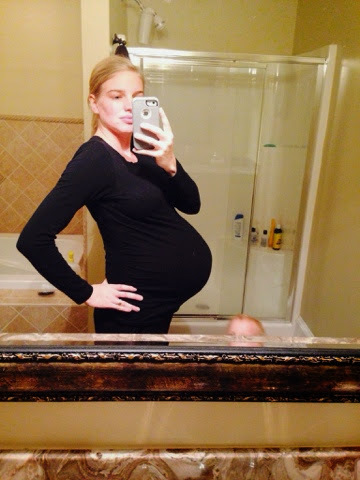 Blogging just didn't seem worth my time and life got in the way--a second pregnancy (yay!) with 3 months of morning sickness (not yay!) followed by a cross-country move from very populous Northern VA to a much, much smaller town in middle Georgia for hubby's job. Honestly, it's been hard...I miss living in a big city so much. Honestly though, the biggest reason why I gave up up blogging is because there are so many amazing lifestyle and fashion blogs out there and I can't ever compete with my limited resources. But I'm realizing that's not the point. I think I need to be REAL and be ME, and not care about the rest. There are plenty of fashion blogs that have beautiful settings, photography and clothing, but not many that are real-life. Do those women ever wear ugly pajamas, have a bad hair day, or step out of the house in a spit-up stained sweatshirt? yes. the other reason why I haven't kept up with blogging. So here's there good old not-perfect iPhone and mirror shot (sorry about the shower background) and yes, I'm VERY pregnant with our second boy! 37 weeks and feeling like I'm literally about to pop! I can't wait to get this baby OUT of my body. I'm tired, uncomfortable and feeling SO ugly. And I can't wait to wear regular clothes again...I'm too big to be pregnant cute and most of my clothes is much too small for my giant belly anyway...so I'm back in my good old standby leggings and tee shirt just about 24/7. Poor husband. I just have no motivation to look cute and I don't even really care at this point--all I want is comfy. My doc has told me this little dude will probably be a week or two early--so we'll see!